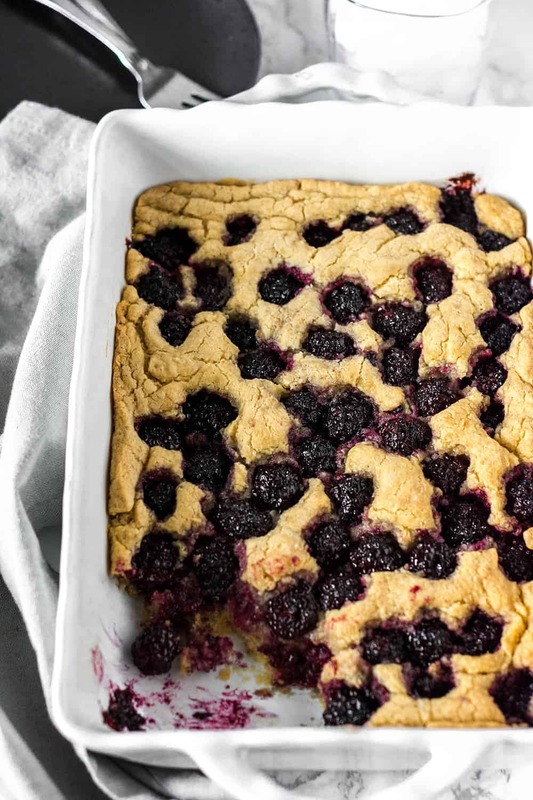 This Vegan, Gluten-Free Blackberry Cake is an easy and delicious cake to prepare with juicy blackberries, it is not too sweet nor tart. Perfect to serve for tea or brunch, it comes together so easily. I had fresh blackberries that I bought recently, they were so sweet and juicy so I decided to prepare this blackberry cake which turned out exactly how I envisioned it. Fluffy and light and beautiful reminds me of my Strawberry Breakfast Cake and my Banana Upside Down Cake. This blackberry cake recipe is definitely a keeper, it was gone in minutes, my family enjoyed it so much and they couldn't get enough. I can't wait to make this recipe again. Next time I plan to serve it with coconut whipped cream or vegan vanilla ice cream. It is so flavorful, I know it will become your favorite as well. 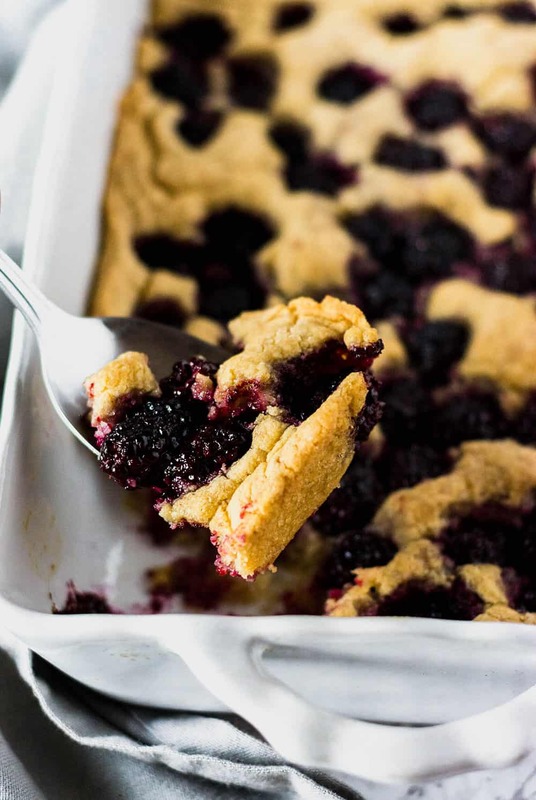 To prepare this blackberry coffee cake, I toss 2 tablespoons of sugar with blackberries and put aside while I prepare the remaining cake. I melt vegan butter and pour in the base of a 9x13 pan. I used Earth Balance non-dairy spread. Next, I prepared the cake batter by mixing almond milk, ground flaxseeds, vanilla in a large bowl. Next, I add gluten-free flour, sugar, baking powder, salt, and mix well. I then pour the cake batter over the melted butter and spread to cover the base of the pan. 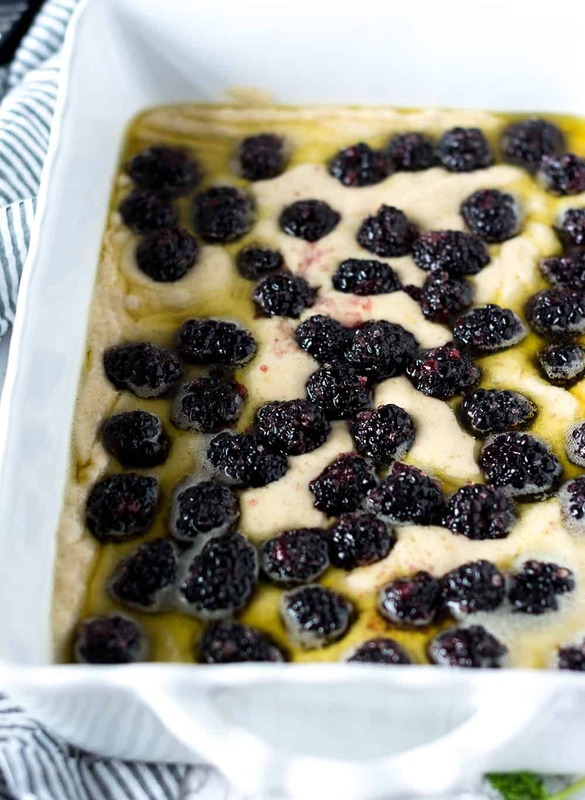 Finally, I scattered the blackberries on top of the batter and bake in a preheated oven. For the gluten-free flour, I used Pillsbury Gluten-Free Flour. Preheat oven 375 degrees. Pour melted butter in the bottom of a 9x13 pan. Mix almond milk, flaxseeds, vanilla in a large bowl. Let it sit for 5 minutes, stir in gluten-free flour, the remaining 1/2 cup sugar, baking powder, and salt until you have a smooth batter. Pour batter over melted butter and spread. Spread blackberries over batter and bake for 40 minutes until golden brown or until toothpick inserted comes out clean. So glad berry season is almost here!! 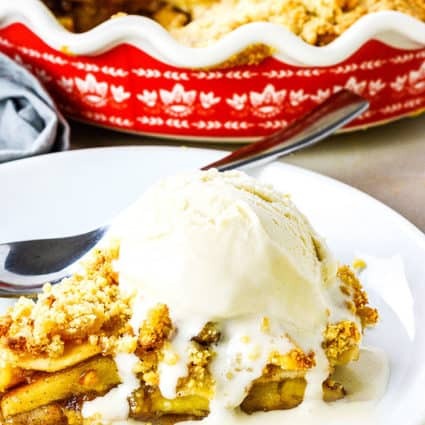 This cake looks really yummy and we use Pillsbury GF flour regularly. It’s surprisingly good! 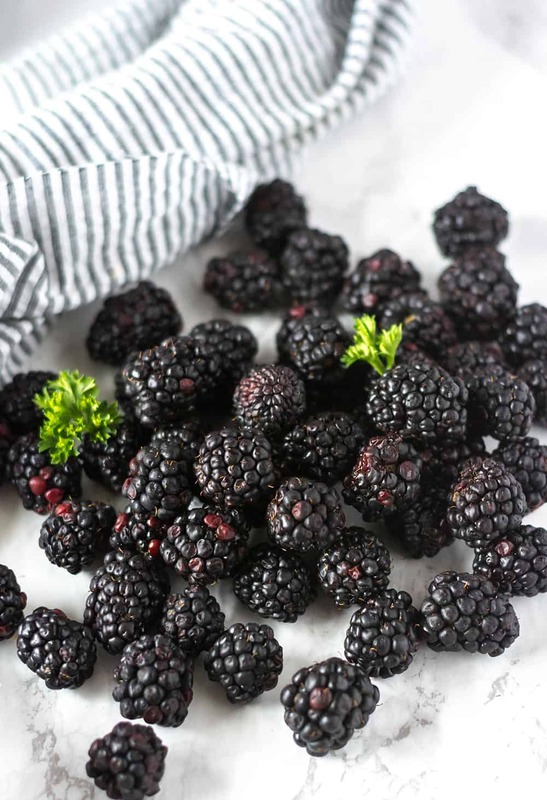 With blackberries quickly coming into season, I’ll be saving this recipe for when I’m foraging for blackberries in the wild. I like the use of flaxseed in this recipe, as I sometimes struggle to incorporate them into my diet. Loving those juicy blackberries! 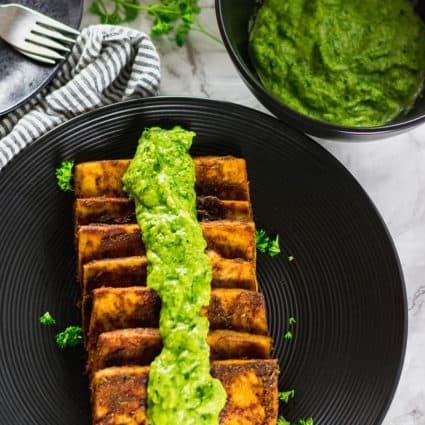 This looks really good (and nice that you added flaxseeds)! Yum! This cake was so easy to prepare and so delicious. That blackberry cake looks delicious! Thanks for sharing this – I’m definitely going to be adding this to my “to-try” list! Going to check out your other recipes too! Hi! I’d love to print this recipe; can you either email me a printable version or direct me to a print button? I can’t seem to find it! The print button is right below the title of the recipe, it is the green tab.